More pictures of many of the people described on this page can be found in Roshni Ray's photo galleries. A genetic analysis showed Roshni's mtDNA as belonging to the M30 haplogroup common in India. Nani Gopal (ননী গোপাল) (30) (b. Bengali mAgha 14, 1325? ; Jan 28, 1919? in moD.AkAThi) married Latika Mukhopadhyay (লতিকা মুখোপাধ্যায়) (of bAga-bAjAra, Calcutta b. Bengalee Maagha 16, 1927?) when he was 24 years old, and around 1946, when settled in Calcutta, had a son called Karan (কারণ), who died young around 1947 (about 4 years old). After that they had daughter Swagata (স্বাগতা) (31) (Babli (বাবলি), born 26 Jan 1952, 1953 according to certificates), son Jayanta (জয়ন্ত) (Debu (দেবু), originally called a variety of names like Devabrata (দেবব্রত), Debashis (দেবাশিস), etc, and gebo (গেবো) of nepAli origin, but called Jayanta when he changed schools, b 30 Nov 1953, 1952?/1954? according to certificates), daughter Sumita (সুমিতা) (Tultul (তুলতুল), b 26 Nov 1955), son Sumanta (সুমন্ত) (Shubho (শুভো), originally called Shubhavrata (শুভব্রত), ShubhAshis (শুভাশিস), etc, but became Sumanta when elder brother became Jayanta, b. 19 Jan 1957) and a daughter Sanchita (সঞ্চিতা) (Kanta (কান্তা), b 29 Mar 1958). In 1962, they settled down in Nabagram (নবগ্রাম), a small village near candannagore. Nani Gopal passed away at 12:30 pm IST (5:30 east of GMT) on Feb 23, 2000. An obituary in his memory is being prepared by the Aitch Family. 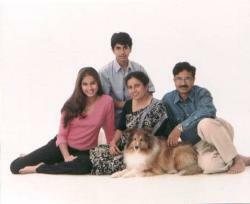 Latika passed away on around 12 pm IST (5:30 east of GMT) on Jan 22, 2002. Swagata, also called Babli (বাবলি), married Janardan Chakravarti (জনার্দ্দন চক্রবর্ত্তী) on 9th July 1973 and had two sons: Bhargav (ভার্গব) (billu (বিল্লু), b 25 Jun 1976; but Apr 1978 or 2nd Feb 1978 according to certificates) (32) and Arnav (অর্ণব) (Guddu (গুড্ডু), b 1 Aug 1981, but July 1 1982 according to certificates). They settled in Nabagrama (নবগ্রাম) near konnagara. Bhargav married Madhusree (মধুশ্রী; also called Tupur টুপুর), born on 21st December 1981, the youngest daughter of Moloy Kumar and Banani Bannerjee (মলয় কুমার ও বনানী ব্যানার্জী) of Sector-1, Salt Lake city, Kolkata on 28 Jan 2007, Bengali 14 Magha 1403. They settled down in Chennai had a daughter Baibhavi (বৈভবী; also called Jhinti ঝিণ্টি) on 11 Oct 2011 at 5:16 am IST in Calcutta. Jayanta (debu) married Kaberi (কাবেরী) (Ranja (রঞ্জা), born 27 October 1961 to Panchugopal Taluqdar (পাঁচুগোপল তালুক়দার), passed away around Dec 20, 2008) on 11 Feb 1985 and had a son called Samanwoy (সমন্বয়) (biDDu (বিড্ডু), b 4:00 pm on 5 Nov 1987) (32). Sumita (tultul) married Animesh Ray (অনিমেষ রায়) (born 14th Sept 1954 to Hrishikesh (ঋষিকেশ) and Gopahemangi née Choudhury (গোপাহেমাঙ্গি চৌধুরী) Ray (রায়); Hrishikesh passed away about 3pm IST on Aug 17, 2001; Gopahemangi passed away about 9am IST on Apr 15, 2009) on 16th January 1978 and had a daughter Mahashweta (মহাশ্বেতা) (Roshni (রোশনী, which she also used as her middle name), b 3:47 pm (Melbourne standard time, 1000 east of GMT) 15 Aug 1982 at Queen Victoria Hospital in Melbourne) (32) and a son Krishanu Anik (কৃষাণু অনীক) (b at 2:52pm PST (0900 hrs W of GMT) 10 Jun 1988 at Sacred Heart Hospital in Eugene, Oregon) who had Y haplotype H1a*. They had mtDNA haplotype M30c. After spending some time in Boston, MA and Rochester, NY, they settled in San Diego, CA, United States of America. Roshni got engaged to Bryan Michael Ricchetti (b. 5 Sep 1977) on Oct 11 2010 and got married in Cleveland, OH on September 24, 2011 (which was registered in San Francisco county, CA on Sep 18). They lived in San Francisco, CA. 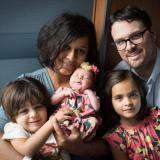 She changed her name to Roshni Ray Ricchetti (with Ray as her midle name) on Oct 11 2011. They went through a Bengali wedding ceremony on Jan 2, 2012 at Salt Lake, Kolkata, India. They had a daughter, Aria Koël Ricchetti, at 2:26pm on 9th August 2012 in San Francisco, CA, USA, and a son, Leo Eshan Richetti, at around 9:45pm on 20th February 2015, and a daughter, Cora Noelle Ricchetti, at around 5:21am on 27th July, 2017, in Chicago, IL, USA. Sumanta (shubha) married Kikuko Amano (天野菊子) in Feb 1987 and had two sons called Somak (সোমক) (also called Yo Amano and Mandeep (মনদীপ), b 17 Oct 1988) and Jaydip (জয়দীপ) (also called Joy Amano) (b 16 Oct 1991) (32). They settled in Tokyo, Japan and may have divorced around 2002. He had two daughters: Anusmita (অনুস্মিতা) Bhattacharya, also called Maya (মায়া), on 29 Jan 2004 and Aparajita (অপরাজিতা) Bhattacharya, also called Uma (উমা), on 13 July 2005 by Prapha Ketkaeo (ประภา​เกตุแก้ว), also called Kwan. They settled in Phuket, Thailand. Sanchita (Kanta) married Narayan Chakraborti (নারায়ণ চক্রবর্ত্তী; sometimes spelled Chakraborty in English; son of Late Hrishikesh Kavyabyakaransmrititirtha, হৃষিকেশ কাব্যব্যাকরণস্মৃতিতীর্থ, and Basanti Devi, বাসন্তী দেবী) on 19 Jan 1983 and had a son called Rhivu (ঋভু) (Anirban (অনির্বাণ), b 21 Jul 1984) Chakraborty, who had Y haplotype R2 and mtDNA haplotype M30c (32). They settled down near Calcutta. Anirban married Arpita, অর্পিতা, only daughter of Prasenjit Bhattacharjee (প্রসেনজিত ভট্টাচার্য্য, son of Late Prafulla Kumar Bhattacharjee, প্রফুল্ল কুমার ভট্টাচার্য্য, and Late Ramala Bhattacharjee রমলা ভট্টাচার্য্য) and Krishna Bhattacharjee (কৃষ্ণা ভট্টাচার্য্য, daughter of Late Nirmal Kumar Ghatak, নির্মল কুমার ঘটক, and Mrs. Anjali Ghatak, অঞ্জলি ঘটক) of Kolkata on 18 November 2014, Bengali 1 Agrahayana 1421. They had a son, Maharshi Chakraborty (মহর্ষি চক্রবর্ত্তী), also called Rishu (ঋষু), born the morning of Jan 25, 2019.